Psychologist Kris Kelvin stays with his estranged father in the country. He is assigned to investigate a space station near the mysterious oceanic planet Solaris. A friend of his father, Burton, warns Kris of strange occurrences surrounding the planet, but he is skeptical. Kris arrives at the space station and gradually discovers that the alien ocean can produce physical replicas of people, "guests", from one's past. Kris's deceased wife Hari turns up, and he begins a relationship with her. Later, the only two other humans on board the station, doctors Snauth and Sartorius, persuade Kris to transmit his brain waves towards the ocean. Eventually, the guests disappear, and islands begin to form on the ocean. The film ends with Kris kneeling, arms outstretched toward his father presumably back in the countryside. The camera pulls back to reveal the Solaris ocean surrounding this area of land. Solaris deals nominally with a voyage into outer space and with contact between humans and an alien life form. However, beneath these standard science-fiction trappings it is a film about man's struggle with his conscience and with the past, about what it means to be human, about memory and loss--and probably many other things as well. The film's subtle power stems from its ability to yield many interpretations and meanings, and the viewer must decide what to make of the beautiful images and elliptical story line. It is filmmaking of the most important and artful kind: masterful cinematic technique in a work that is both puzzling and revealing. The film subverts certain conventions of the science-fiction genre, often substituting present-day observations for technological fantasies. Instead of Kelvin's logistical preparations for space travel and his subsequent blast-off, we are given a more commonplace travel scenario: an extended highway montage of the offended Burton's car ride home. This initially puzzling sequence, complemented by obscured futuristic sound effects, threatens to languorously break away from the film into its own kind of nonnarrative poetry. It culminates in a stylized vision of modern transportation, a nighttime image of a thousand automobiles painting on the darkness with their streaking lights. The filmmakers surround these abstract travelling shots with lush, static scenes in the countryside and, before ever leaving the Earth, suggest how truly alien different regions and lifestyles can be to each other. On a strictly aesthetic level, Solaris forms a brilliant visual, rhythmic, and sonic combination. The tracking shots in the space station's hallways give the area a real sense of depth and also create an ominous mood. The film's many long takes provide time for the viewer to take in the carefully constructed aspects of mise-en-scene. For example, the station is not a stylishly antiseptic area, but a cluttered and lived-in place explored in numerous medium shots. Additionally, the music (by the talented Eduard Artemyev) perfectly complements the spiritual and mysterious nature of the film. Save for one classical piece, the score is composed of a collection of barely audible pulses and low whirrings that complement the somber futuristic narrative. All of these stylistic elements come together most memorably during the sequence when Kris first sees the duplicated form of his wife, Hari. It is a subtle scene of astonishing beauty that shows how well cinema can express moods and emotions without being simplistic or melodramatic. At first completely dependent on Kris, Hari's double begins to mature into her own entity. She makes a moving declaration of her humanity during an argument with Sartorius and stays behind in the library when Kris wanders off with the drunken Snauth. Kris is distressed when he realizes that Hari has been left alone, and it is becoming clear that he needs her now as much as she needs him. He rushes back only to find her oblivious to his absence and intently focused on a painting of a village in winter (specifically, Return of the Hunters by Pieter Bruegel). It is in this scene where the film espouses art as a mirror of reality, as a tool for understanding the world and significant in Hari's development as an individual. The camera follows her gaze across the surface of the work in a way that is profoundly cinematic. Dissolves, zooms, and slow tracking shots, matched by more superb work on the soundtrack, convey the spectrum of activity that Bruegel originally captured. As this sequence concludes, Hari is reminded of a brief shot from some home movies that Kris showed her earlier: a snowy scene of a child by a swing. Kris wakes Hari from her contemplative state, but not before painting, film, and life itself have been linked together by a lyrical chain of sound and image. The Solaris ocean makes it possible for Kris to show his love and to reconcile with his deceased wife. However, he enters into a form of self-deception because this is only a re-creation of Hari; the real Hari is dead and cannot share these experiences with Kris. As the alien Hari gradually becomes more human, she realizes that her identity is different than that of the woman Kris had previously loved because she shares few of her memories. The film suggests that the past and memory are ultimately more real or important than the present because they define one's self and, inevitably, guide future actions. The replicated Hari eventually separates herself from Kris after becoming aware of her substitutional role and of Kris's impossible desire for the real Hari. Apparently, the reunion between Kris and his father at the end of the film is a similarly false one; it may have some resonance for the son but doesn't affect his real parent on earth. Kris emerges as an extremely sympathetic character who is plagued by his conscience and desperately desires to have another chance at what has occurred in his life. When the Solaris ocean provides him with this opportunity, he takes it and lives out his fantasy as long as he can, perhaps trying to repress the realization that present reality will catch up to him and he will never be able to show his love and regret to the people from his past. Solaris is a complex work that respects the audience's imagination and encourages personal readings. It works today as a riposte to the soulless technophilia of much science fiction, managing to be both intellectually provocative and emotionally affecting. Mysterious yet sensitive, it is also one of the most dream-like films I have ever seen and, consequently, one of my personal favorites. 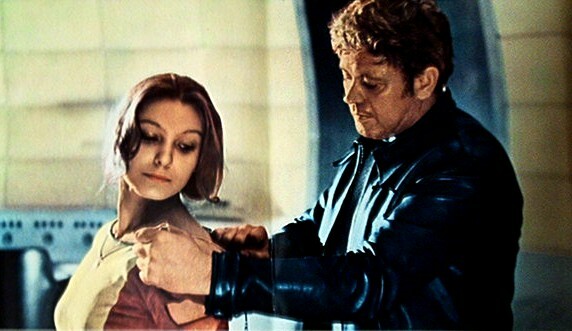 Solaris was realized by the important Russian director Andrei Tarkovksy, an expressive and artistically committed figure in world cinema. It's unfortunate but understandable that there are not many filmmakers of this kind in today's commercially-driven industry, and cinema's relevance as an art form suffers for it. But let's not be depressed. We can always revisit great films like Solaris, which indeed may be the greatest of all-time, the unmatched pinnacle of cinematic expression.